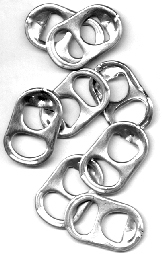 RMHC of Tampa Bay supports your recycling of pop tabs for the benefit of our program and value this donor activity by many community groups and individuals in and around Tampa Bay. Please bring your tabs to one of our four Houses for recycling, or if it’s more convenient, you may take them to your nearest recycler and have them issue us a check. If you have questions about recycling for RMH, please contact Alison Barrick at (813) 258-6430, ext. 2.